This is my first attempt to create a video and I must admit this caused me a lot of anxiety. Not only was I uncomfortable being recorded on camera, I also had no idea how to compose, record, save, and submit a video. Here are some tips for anyone else attempting to create an Internet video for the first time. Tips for Making Your First Internet Video! This handy little video recorder is great! I didn't have much time to shop so I went with a friend's recommendation and then read the reviews on Amazon.com to select a model. I decided to purchase a Flip UltraHD from Amazon.com for about $160 and had it in a few days. At first I thought I would just roll the camera and blabber on and edit this into a video. This is not a good idea! I blabbered on for more than 5 minutes and not only was I very uncomfortable (which shows in the video) but my thoughts were haphazard and unplanned. I changed my approach to make a series of short takes instead. Each "take" was planned for 10-20 seconds--short enough so that I could memorize the lines. I did each "take" 4-5 times until I was comfortable with the flow of my words and inflection. These multiple short takes also helped calm my nerves which helped me appear much more confident in the video.
. It helps to have a plan. I only had 60 seconds to work with so I attempted to create a 3 or 4 part outline that addressed the questions proposed by the contest writers. For each heading in my outline I composed 2-3 sentences that I wanted to capture for the video. Each topic was short enough to memorize so that I could film each segment in just one take. After my first attempt to edit the segments together I quickly realized that it is much easier to stitch the clips together when I "padded" the start and end of each take with about two seconds of silence. Let me also add that you should have a comfortable expression on your face! This "freeze frame" expression is what will appear on the video before it starts playing so it helps to have a nice smile and not have your mouth open. I learned that eye contact with video is important. The FlipVideo is such good quality that it is noticeable if I was attempting to read queue cards even when placed right next to the FlipVideo camera. 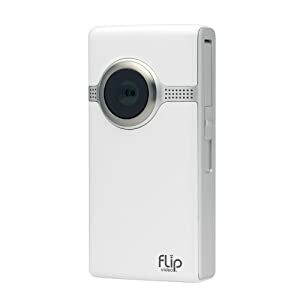 As for vocal delivery, the FlipVideo produces video with amazing sound quality. It helps to speak loudly and clearly. I was filming in my garage so the sound was well protected from outside noise from wind or traffic. I was able to trim the front/end of the takes and stitch them together very easily with the software that comes along with the FlipVideo camera. I spent about an hour trimming the clips to get the video to fit into a specified 60 second video. Then I exported the video and quickly realized it was 88,000KB in HD! I had to get this down to less than 10MB to submit. My brief searches turned up overwhelming volumes of information on video quality, formats, aspect ratios, etc. This is all Greek to me still. I opted to upgrade QuickTime to QuickTime 7 Pro from Apple for about $29. This application allowed me to convert the video down to less than 2700KB while maintaining the letter box aspect ratio. The sound quality was unaffected by the conversion, but of course, the video quality deteriorated dramatically. But that's o.k. as this contest is supposed to be for amateurs! Now that I have my own FlipVideo and know how to create and edit videos, I am hoping to take on a few more projects for my blog and web site for the Northwoods Casket Company and DIY Coffin. Here are some of my ideas for projects.